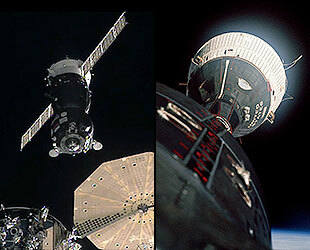 – Fifty years ago, two spacecraft met in orbit, achieving the world's first rendezvous between two piloted vehicles. On Tuesday (Dec. 15), two more spacecraft did the same, but as a matter of course, underscoring the progress made in the past half century of human spaceflight. At 11:33 a.m. CST (1733 GMT), just about six hours after it launched, Russia's Soyuz TMA-19M spacecraft pulled up alongside the International Space Station, bringing a three member crew to the orbiting outpost. It was the 45th time a Soyuz had caught up with the space station and the tenth expedited rendezvous after orbiting the Earth four times. 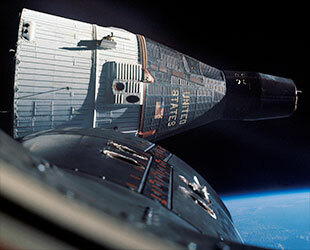 The space capsule to space station meeting coincided with the 50th anniversary of the first-ever rendezvous between NASA's Gemini 6 and Gemini 7 spacecraft. That feat, on Dec. 15, 1965, marked the first time the United States had surpassed the former Soviet Union in the Cold War space race that drove that era of space exploration. More importantly, it demonstrated a crucial skill needed to land astronauts on the moon just four years later, as well as all that came after, including operating the space station to this day. 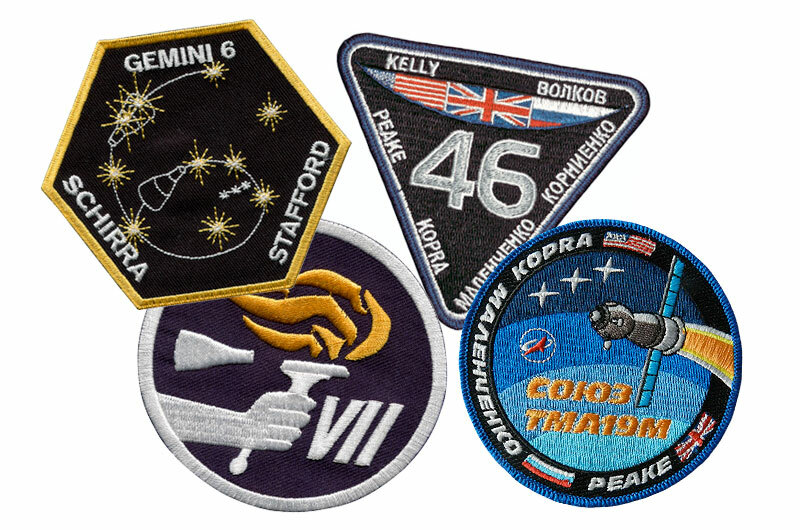 "It has really been an evolutionary path for us," said NASA astronaut Tim Kopra, a flight engineer on the Soyuz TMA-19M crew, reflecting on the anniversary in a preflight press briefing held at the launch site on Monday. "I think all of us look at those predecessors as our heroes, just as they are to many people in the American and international public." 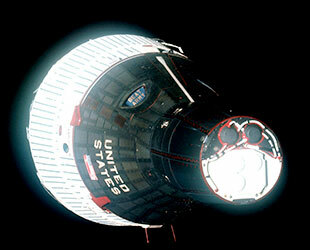 Originally, Gemini 6 and Gemini 7 weren't intended to meet in orbit. The Gemini 6 mission was tasked with catching up with an unmanned target, while, separately, Gemini 7 was to demonstrate that astronauts could spend two weeks in space, the maximum length for a mission to the moon. Gemini 7 still achieved its intended 14-day goal, but after Gemini 6 lost its mark, a spent Agena rocket upper stage, in a launch failure, the flight was quickly re-planned, such that the pair of two-man space capsules would attempt the first rendezvous. 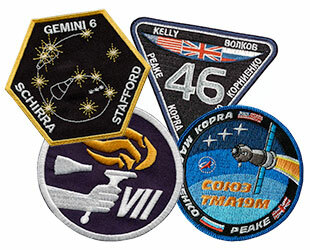 Gemini 7 launched Dec. 4, 1965 with crew members Frank Borman and Jim Lovell on board. Three hours and 15 minutes after safely reaching orbit, the radar on Gemini 6 made contact with Gemini 7 as the two capsules were still 270 miles (435 kilometers) apart. Soon thereafter, Schirra radioed a Tally-ho, making voice contact with Borman. "We're looking for you," the Gemini 6 command pilot said. "Hang on, we'll be up there shortly." Though the Soviet Union had twice launched simultaneous pairs of manned Vostok spacecraft in 1962 and 1963, the cosmonauts only achieved radio contact, coming no closer than several miles of each other. 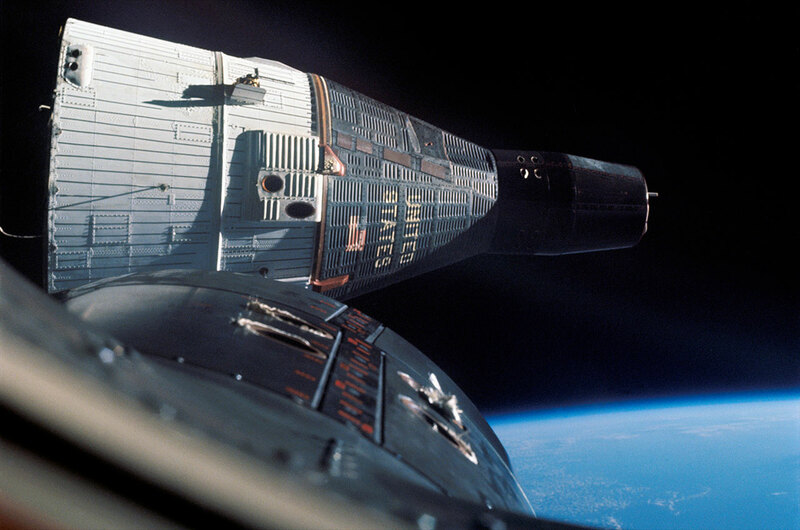 By comparison, Gemini 6 and Gemini 7 moved within one foot (0.3 meters) of each other, close enough that the two crews could read the "Beat Army" and "Beat Navy" signs they held up in their respective windows. "We're flying in formation with [Gemini] 7," Schirra radioed. "Everything is go here." 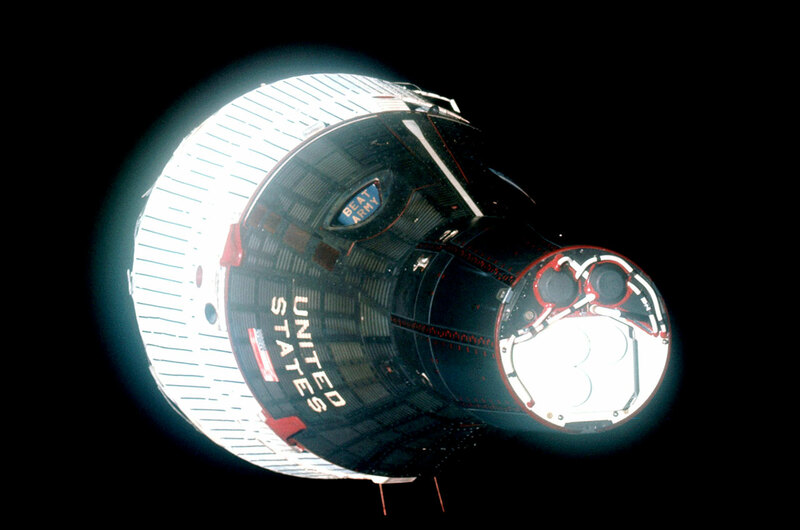 "Looks like the flag and the letters are seared as much at launch as they are when you come back at re-entry," said Lovell, describing the markings on the side of the Gemini 6 spacecraft. The two capsules flew together in orbit for about five hours before Gemini 6 fired thrusters to back away from Gemini 7 and begin the return home the following day. 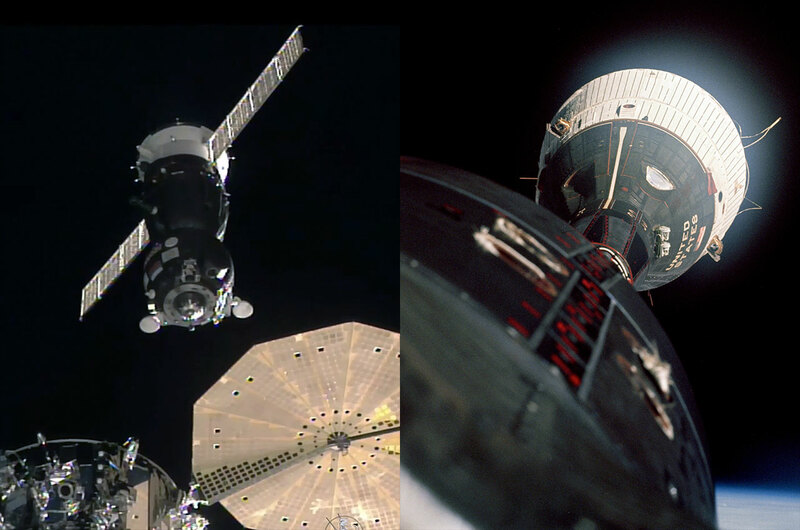 Fifty years later, the crew of Soyuz TMA-19M were letting their on board software handle flying the rendezvous to the International Space Station, when the automated approach was aborted. The crew then took over manual control. "It is designed to automatically occur all the way through hooks latching, which is a great thing," Kopra said during an interview with collectSPACE this past September. "But [the crew] is trained so that if things happen where we can no longer have the automatic mode, we can download and go to manual." This is Kopra's second rendezvous with the space station, after a earlier flight in 2009 when he launched and landed on the now-retired space shuttle. "In general, in principle, it is the same," he said, describing the differences in flying the rendezvous on the shuttle and on the Soyuz. "The approach rate and the mechanics of it are different hand controller skills. The big picture is it's the same process, but when you get down to individual skills it is a lot different." Now docked to the space station, Kopra, along with crew mates Yuri Malenchenko of Roscosmos and Tim Peake of the European Space Agency (ESA), are set to live on orbit for the next six months.